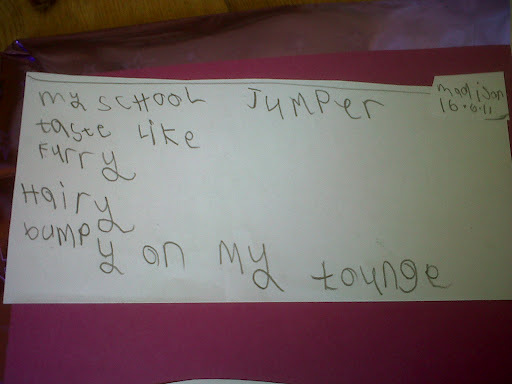 The inaugural ‘Discover Challenge‘ at WordPress Blogging the Senses has reminded of the time I worked with groups of Year 1s (5 and 6 year olds) and Year 5s (9 and 10 year olds) and I asked the children to use all of their senses to write about their school jumper. I wrote a post about it here. I told the children not to worry about spelling or grammar but made it clear that they could help each other out with this if they wanted to and, of course, they could ask me or their teacher for help. They worked collaboratively, in pairs, one younger and one older child together, and I encouraged them to talk about their ideas before they wrote anything down. They had permission to help each other and to copy each other, if they wanted to. It wasn’t a silent classroom – there was a purposeful buzz of noise. 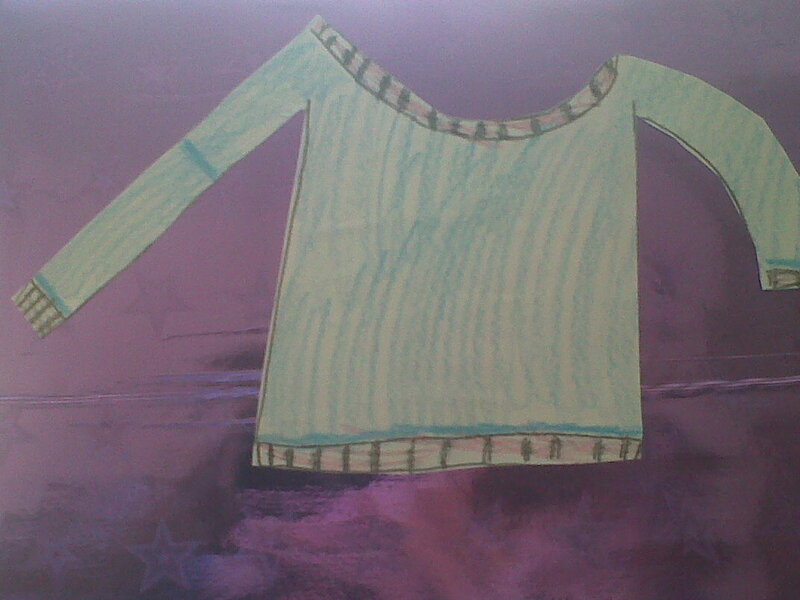 There was time for the children to draw and colour in their school jumpers. 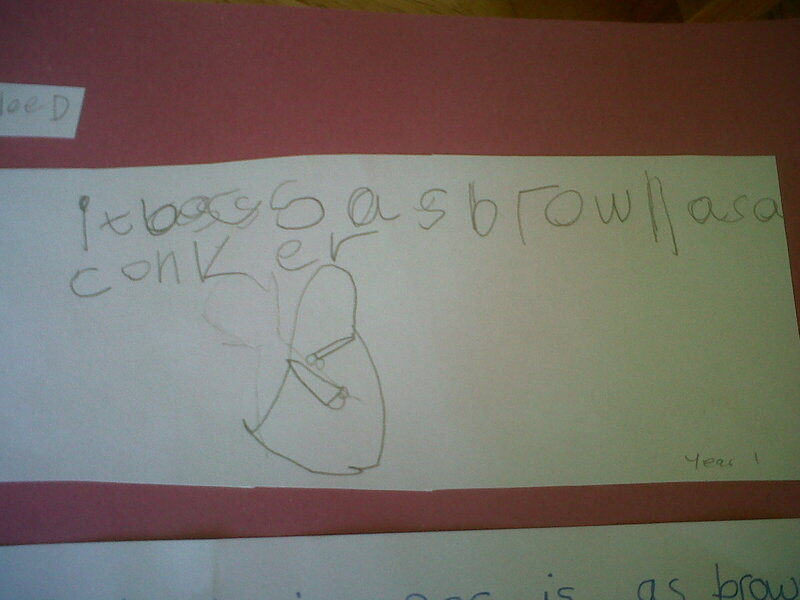 Some of them then added their ‘sense poems’ around the shape of their drawings. I loved the fact that at least one of them coloured their school jumper blue even though their uniform was brown. Perhaps they were thinking of the colour they’d like their uniform to be. This willingness to play with the parameters they’d been set gave me a sense that the children were experiencing some freedom in this exercise, that they didn’t feel hemmed in or prescribed by an exact set of rules. It smells like soap, trees, wood and cheese strings. It sounds like wind, sea, air and a train. I’ve never tried this writing exercise with adults but I’m tempted to give it a go one day, perhaps as a warm-up exercise. Permission to break rules, to not write syntactically, to believe in blue when brown is right in front of you, could be joyfully liberating. It could be disastrous, too, of course but I would love to see what would happen. Encouraging creativity and not being prescriptive feels pretty topical, in the UK at least, with a new government guideline to do with children’s writing issued this very week (this one about the correct use of exclamation marks, believe it or not!!). Anyway, perhaps you’ve used similar exercises based around the five senses? I’d love to know what they are. Have you used them with adult writers? How did they get on? Looking forward to some responses with or without the exclamation marks. ! Thanks for commenting, Su. It’s interesting how some people are able to stay creative, though, isn’t it? Hi I have done this with adults in a different way. They used one line of alliteration, one simile, one metaphor, personification and a line of onomatopoeia to describe a topic EG the sun. Put together they make a lovely poem!